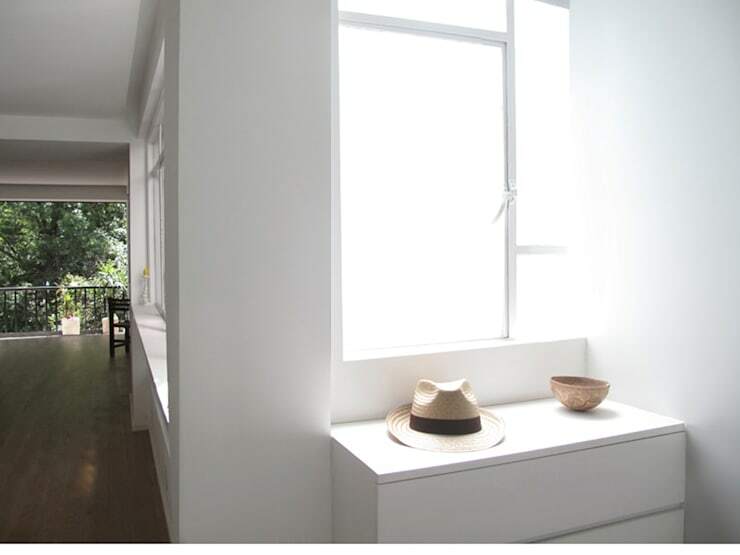 general design idea: As the clients are a young couple, the original layout has been opened up by reducing the number of bedrooms, in order to make better use of the existing sources of light and ventilation, which also improved the apartment`s accessibility and energy efficiency. This strategy allowed to create a loft feeling combining the kitchen with a spacious living-dining room with an integrated workspace. To make the great visual relation with the park enjoyable, we orientated the new dormitory towards a silent interior patio and by that created a more private and quiet realm on the north-west side, reorganizing the apartment`s distribution completely. 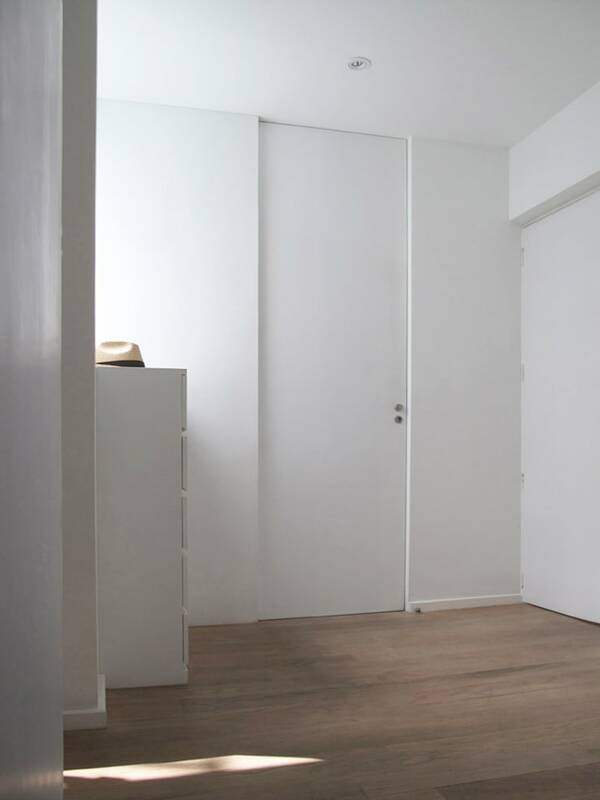 Dividing walls, previously obstructing he apartment`s overall perception, splitting the park facade into two separate berdrooms, were removed. The park view, where the living-dining room now is located was recovered as the main quality of the apartment. 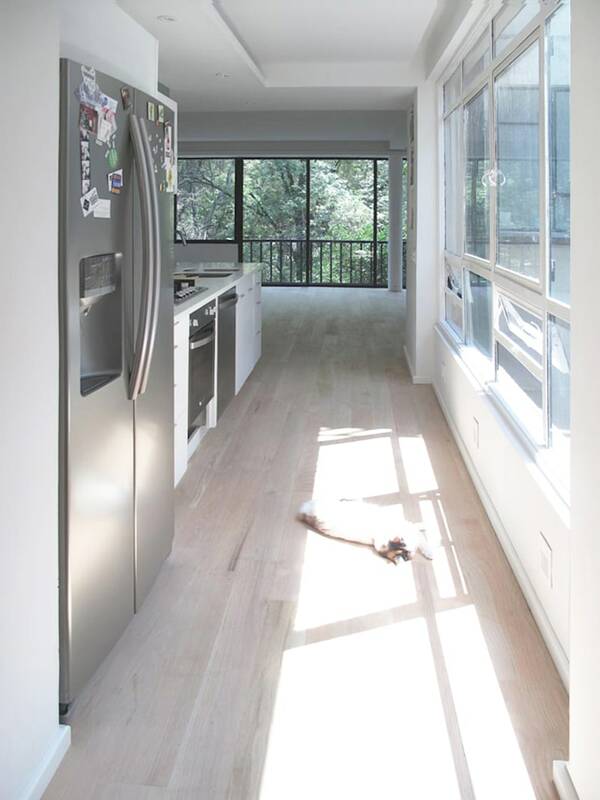 The so obtained open-plan, living- and dining room, opens up views and leads out to the balcony beyond. 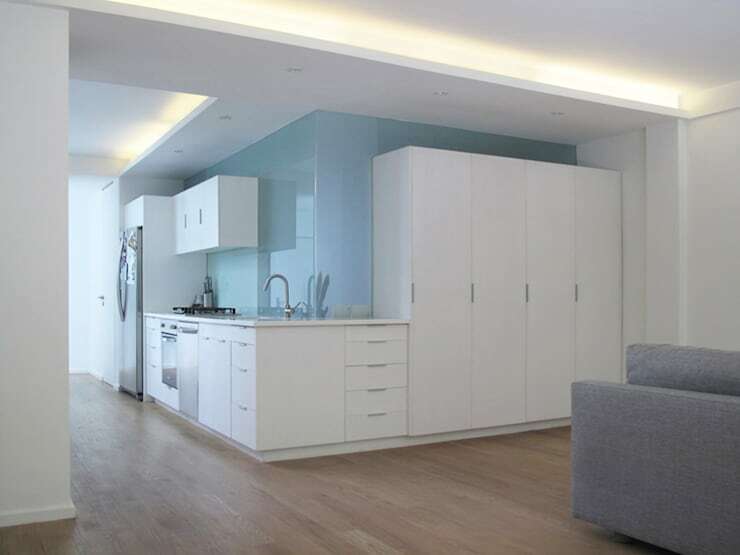 The newly created areas, offer its occupants a more spacious and varied living environment. The public area is connected through the now bigger kitchen with the entrance area and the added guest’s restroom. The orientation is double-facing, allowing double cross ventilation and lighting in the centerpiece of the home. On the other hand, the master bedroom is now located towards a well illuminated and quiet interior patio and is connected directly to a spacious private bathroom. The refurbishment aims to enhance the structural value of the building and for that, beams and pillars of the public area were dissected. The visual potential of these elements, added to an enhanced total floor-to-ceiling height underline this areas qualities. interior design and lighting concept: A naturally treated waxed oak wood floor, covers almost the entire area of the home, and was used in combination with white matt surfaces, to reinforce the continuity between the various spaces. 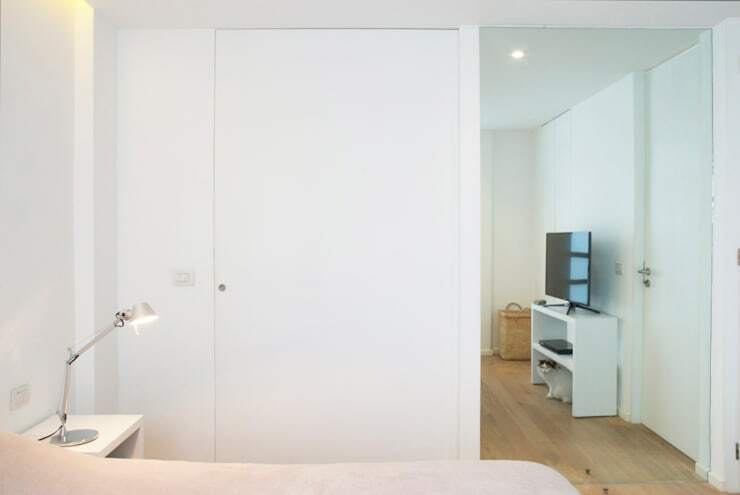 Solid Interior wall heights were reduced to 2.10 meters, bearing mate white built-in cupboards and cabinets to create an open feeling, and by using translucent glass as separator above, it was possible to lead light deeper into the apartment’s interior spaces. 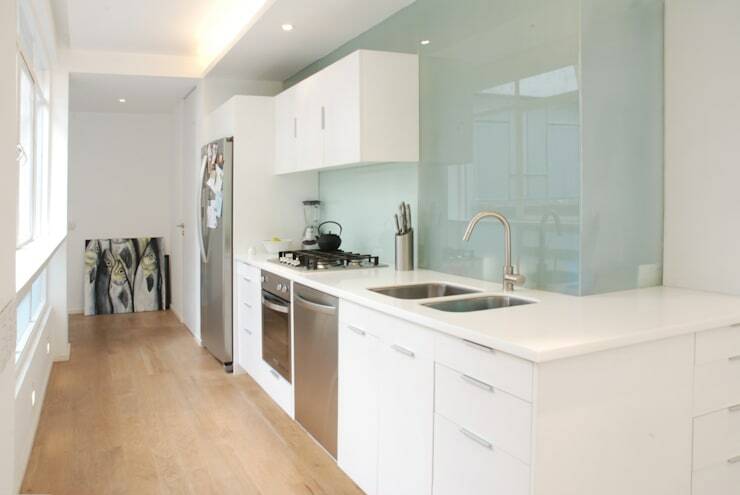 Translucent glass walls also divide kitchen and living area from the interior bathroom. The reflective side was used as kitchen backwalls, while the bedroom and bathroom areas received the mate translucent glass surfaces. All doors were integrated with floor-to-ceiling height underlining the visual unification of spaces. Bathroom floors were covered with a screed-like material, which also formes wall and washing stand surfaces. A color accent was added to the master bathroom by using green mosaic tiles covering the entire shower area and underlined by wall-washer lighting. 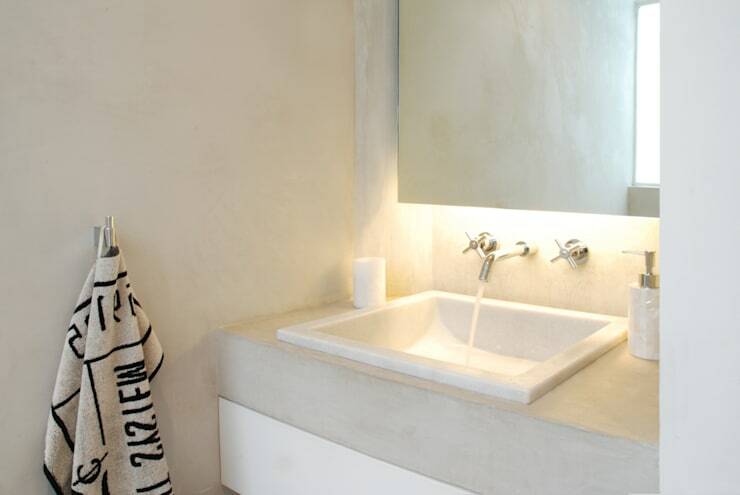 Especially manufactured marble washbasins in combination with indirect lighting help in creating a warm atmosphere. White suspended ceilings, raised more than 1 foot in certain areas, help to define these areas by creating visual contrasts to the neutral palette of colors in the rest of the project, accentuating this effect by the use of integrated indirect lighting. White and off-white paint, keep the apartment bright and provide a calm almost serene, modern backdrop for more colorful accessory. The apartment counts with downlights in all areas, dimable, indirect lighting in the bedroom, kitchen and living area, displacable downlights for art illumination in the living-dining area, accentuating lower wall-lighting in the kitchen-hallway, and a color accentuating wall-washer in the shower area.